I’m pleased to announce that there is an update available (v22.5.4.24) for the Smokey’s Choice Awarded top-notch security software Norton Security, Norton Security with Backup, Norton Internet Security, Norton 360, Norton Antivirus and Norton Security Suite. As with all previous Norton Security software updates, this version is being released in a phased manner. The update is available in all supported languages. To download it, run LiveUpdate. * Several fixes for desktop flickering issues’ and other problems with Win10 upgrades. * Fix for a crash in Hebrew specific layouts. It’s easy to verify you have the update, just launch the Main User Interface, click on Help, and select About. This update v22.5.4.24 is currently officially available via LiveUpdate only, however there is also the possibility for a direct download from the Symantec/Norton servers. You can install the downloaded update/patch over the top of your existent Norton product. This time too the update will be no problem at all, all previous Norton Security settings will remain unaltered after the update. The update will be accomplished within a few minutes, reboot is not not be required. Important: run LiveUpdate after updating to the new version! Like the Smokey’s Security Weblog Hall of Shame Awards, the Smokey’s Choice Award has the sole purpose to improve users experiences and interests. Where the intention of our “Hall of Shame” is to achieve a change of mind in positive way and improvements in behavior and procedures by the Awardees, the Smokey’s Choice Award will be granted to security (related) products that has proven to be the very best quality software available on the market. Issue ‘real security’ and ‘serious improvement’ should have highest attention of security vendors, this all in customer’s interest. The Smokey’s Choice Award is our acknowledgement of products of outstanding quality and effectiveness, in this way we honor exceptionally well software development by some vendors which results in such top-notch products no matter it concerns free software or paid products. All Smokey’s Choice Awarded software is thoroughly tested/reviewed, in the decision to provide a product with the Award we also include a judgment concerning the price of the software compared with the competition and what will be offered for the price. Only when we are fully convinced about quality, effectiveness and price / performance, a product will be granted the Smokey’s Choice Award. Hence we highly recommend all software provided with the Award. Again our congratulations to all Awarded vendors! Symantec/Norton released Norton 360 v5.1.0.29 (patch 5.1). Note: the patch is currently available to ENGLISH users ONLY. Norton will release the patches in other regions soon. You can also receive the update by running LiveUpdate and download the update. A reboot will be required. All downloads are originating directly from the Symantec/Norton servers, for security reasons I strongly advise only to download from these vendor servers. – Corrected an issue where your product may report a loss of subscription days after upgrading from a previous version. – Added performance improvements for IE 9 plugins. – Fixed some Registry Cleaner hangs that may have previously occurred. – Online Backup & Restore fixes for very large (> 4GB) files. – Fixed compatibility issues with 3rd party software such as Corel Paint Shop Pro & Max SEA. Symantec/Norton released v18.6.0.29 (patch 18.6) Norton Internet Security 2011, Norton Antivirus 2011 and Norton Internet Security Netbook Edition 2011. Note: the patch is currently available to ENGLISH users ONLY. Symantec/Norton will release the patches in other regions soon. You can also receive the update by running LiveUpdate and download the update. A reboot will be required. The new NIS/NAV/NIS Netbook Edition 2011 v18.6.0.29 as offered for download in this blog can be installed over the top of existent version (18.5.0.125), the update will not deliver any problem, all previous 2011 settings will remain unaltered after the update. The update will be accomplished within 1 minute, reboot is required. All downloads are originating directly from the Symantec/Norton servers, for security reasons I strongly advise only to download from these vendor servers. – Fixed compatibility issues with 3rd party software such as Coral Paint Shop Pro & Max SEA. – Fixed an issue where Norton Insight might falsely report 0% trusted when Performance Monitoring was disabled. – Fixed an issue with the Activity Map might not update when Smart Definitions are enabled. – Improved instances where the Norton AntiSpam Toolbar might be erroneously disabled (or “grayed out”) in Microsoft Outlook 2007 and Microsoft Outlook 2010. – Corrected an issue where “Custom UI Runtime Error in Norton AntiSpam Outlook Plugin” might display when using Microsoft Outlook. – Fixed an issue where the option to “run” an executable was missing from a File Insight/Download Insight window. – Corrected an issue where Idle Full System Scans would show report inconsistent amounts of Scanned Files. – Fixed an issue where Full System Scans would not run continuously, including when the machine is left idle. – Fixed an issue where the Norton Product may display “Subscription Expired” after updating from a previous version. – Fixed Internet Explorer crashes that were due to Intrusion Prevention. – Performance Enhancements were made on the Norton Toolbar for Internet Explorer 9 Beta. – Enhanced Settings migration when updating from an older version. – Usability and Performance improvements to the support experience. – Added better Norton AntiSpam support for Microsoft Outlook configured with multiple accounts. – Corrected a few instances of 8504 errors that may appear when the Norton product is launched. – Fixed a Registry Leak issue that may occur during shutdown. Symantec/Norton released v18.5.0.125 (patch 18.5) Norton Internet Security 2011, Norton Antivirus 2011 and Norton Internet Security Netbook Edition 2011 (Stable/Official Release). Like before, I installed the new NIS 2011 v18.5.0.125 over the top of my existent version (18.1.0.37), also this time the update was no problem, all previous 2011 settings remained unaltered after the update. The update was accomplished within 1 minute, reboot was required. Note: all downloads are originating directly from the Symantec/Norton servers, for security reasons I strongly advise only to download from these vendor servers. 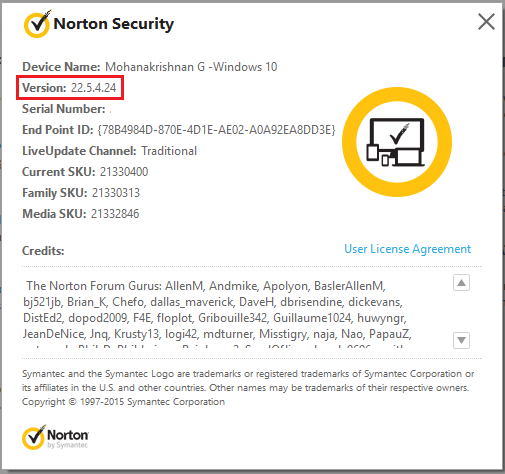 The issues that some users were experiencing where the Norton product would lock up after installing the 18.5 update was due to a definition that was applied after 18.5 was installed. Symantec have since corrected that definition and the issue will not occur. It’s no longer enough for antivirus software to scan files on your PC. You need someone looking over your shoulder and telling you whether it’s safe to click that link; whether the popup for that software update is legitimate; and whether that download from your favorite social network is actually a tool created by organized criminals for stealing your personal information. You need an all-in-one Internet security suite capable of identifying, blocking, and cleaning up after a wide array of malware. We examined 13 security suites for this story. To handle our expanded Internet security testing, PCWorld contracted for the services of AV-Test.org, a respected security testing company. We looked at traditional signature-based detection (which indicates how well products can block known malware) and at how well the suites cleaned infections and blocked brand-new, live malware attacks. In many respects, the suites we looked at produced closely bunched results, but they did vary in the efficacy of their protection and in the extra features they offered. Ultimately, we picked Symantec’s Norton Internet Security 2011–the most balanced of the suites–as our overall winner. There have been several reports on the forums where after applying the Norton Internet Security/Norton AntiVirus 18.5 patch (is version 18.5.0.125), the Norton product may lock up or cause the system to become unstable. While this issue only seems to affect a small number of installations, we’re still taking this issue seriously and are quickly researching the cause of this problem. We will be halting the throttled LiveUpdate release of 18.5 for the time being while we investigate these issues. If you are experiencing this issue and would like to assist us in gathering information (debug logs and process dumps) for this issue, please post a response in THIS THREAD. The more logs and dumps we get, the more information we have that will help us make the proper corrections. Norton Internet Security 18.1, Norton AntiVirus 18.1 and Norton Netbook Edition 18.1 in English, French, German and Dutch language (direct downloads from Symantec/Norton servers too) – https://smokeys.wordpress.com/2010/08/28/norton-internet-security-2011-and-norton-antivirus-2011-final-rtm-released/Some users are reporting troubles uninstalling. Try uninstalling from Safe Mode. If that fails, you can use the Norton Removal Tool.If you have 18.5, but are not experiencing any issues, it is advised that you remain on 18.5. Alert: bug in Norton Internet Security 2009 reported by the Norton Community: “user names and passwords AutoComplete” always enabled in IE7. Fix: change “HKCU\Software\Microsoft\Internet Explorer\Main\FormSuggest Passwords” to “no” and change the permission to read-only in regedit. Advice: before editing the registry, make a backup of it. First I have to warn the “Almighty Clan of Norton Bashers and Haters”: don’t read this post. It will deliver you a bad headache… Beacuse: past week I have tested Norton Internet Security 2009, and it confirmed the enthusiastic conclusion of other tests: a top-notch security suite, best of the best. IMHO The Absolute #1 among security suites. Period. Apparently Symantec/Norton have learned from the mistakes made in the past, have listen serious to their customers, subsequent revamped their 2009 suite and the result is sensational: to other vendors of security suites it will be a stiff task to beat NIS 2009. To me, the only disappointing part of NIS 2009 is the Antispam module, but please keep in mind the pros of the suite are in the majority: Antivirus, Firewall, Antispyware and minimal performance impact. And also keep in mind that most security suites have a weak, unsatisfying Antispam module. Without any hesitation i highly recommend Norton Internet Security 2009 to all people looking for a top-notch, reliable, easy to use all-in-one security suite. Below I provide you with an comprehensive test/review, performed by PCMag. That review, same is valid for other NIS 2009 reviews, confirm my own positive experiences and impressions. This is definitely the slimmest, most unobtrusive Norton ever. Its protection is top-notch where it counts, though antispam and parental controls are still weak. As the best all-around security suite yet, it’s our new Editors’ Choice. Minimal performance impact*. Extremely effective spyware and virus protection. High-powered, comprehensive firewall. Free, proactive support. Phishing protection. Automated log-in, form-fill. Network map with remote configuration. Antispam misses too much, blocks too many valid messages. Rudimentary parental controls. Network map allows no remote correction of reported problems. *Confirmed by AV-Comparatives Performance Test Report: “Impact of Anti-Virus software on System Performance”, dated 2008-11-18. You can find the report at the bottom of the COMPARATIVES section of av-comparatives.org. Symantec Corp. has confirmed flaws in its most popular consumer security software that could give attackers the means to hijack the Windows PCs that the programs are supposed to protect. The vulnerabilities are in an ActiveX control that ships with several products, including Norton AntiVirus, Norton Internet Security, Norton SystemWorks and Norton 360. According to alerts released Wednesday by VeriSign Inc.’s iDefense, the ActiveX control SymAData.dll sports two vulnerabilities that could be used “to execute arbitrary code with the privileges of the currently logged in user” by attackers able to entice victims to malicious Web sites. Symantec confirmed the vulnerabilities Wednesday in its own advisory, and said the buggy control has shipped with Windows versions of Norton AntiVirus 2006-2008, Norton Internet Security 2006-2008, Norton SystemWorks 2006-2008 and Norton 360 Version 1.0. While it acknowledged the bugs, Symantec also downplayed the threat, saying that attacks would succeed only from specially crafted sites. “To successfully exploit either vulnerability, an attacker would need to be able to masquerade as the trusted Symantec Web site, such as through a cross-site scripting attack or DNS poisoning,” read the company’s advisory. However, cross-site scripting attacks have become common, and although DNS “poisoning” — fooling a DNS server into thinking the bogus routing directions it’s received are authentic — is less common, it’s not unheard of. The flawed ActiveX control is used by Symantec’s AutoFix tool, which is included with some of the company’s software and may also be downloaded to a PC during a live chat with a Symantec technical support representative. AutoFix diagnoses PC problems and offers solutions. On-demand AV-Comparative February 2008 released.